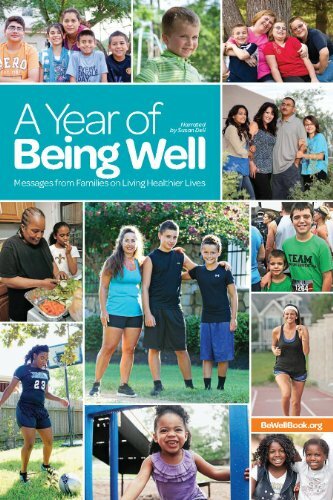 A Year of Being Well: Messages from Families on Living Healthier Lives is an easy-to-follow, 13-month quick-start action guide that features the stories of 20 families who are creatively finding ways to live healthier lives, and fight childhood obesity in their homes, schools and communities. These families come from a variety of backgrounds, but they all share a common struggle: Balancing healthy habits against the challenge of tight schedules and budgets. The aim of the book is to make it easy for parents to start their families on a path to a healthier lifestyle by undertaking simple steps each month, organized to increase a family's chance for success. The book is a product of the Michael & Susan Dell Foundation and the Alliance for a Healthier Generation, a nonprofit organization founded by the American Heart Association and William J. Clinton Foundation. Susan Dell - healthy living advocate, co-founder of the Michael & Susan Dell Foundation and wife of tech legend Michael Dell narrates the book. The foreword is written by President Bill Clinton. The list price for A Year of Being Well: Messages from Families on Living Healthier Lives covers handling and selling fees only. No profit will be generated from the sale of this book. The book was developed by the Michael & Susan Dell Foundation and the Alliance for a Healthier Generation. The Dell family foundation advocates the need for childhood obesity prevention strategies to intervene at all levels of a child's environment, including at the individual level, within families, within schools, and in the community. The foundation's Health Portfolio reflects the passion of book s narrator, Susan Dell, the co-founder and chairman of the board and the driving force behind the foundation. An accomplished athlete, Susan was a member of the President's Council for Physical Fitness and Sports and is a board member of the Cooper Institute in Dallas. In the U.S., she is specifically focused on encouraging kids to be more physically active and on promoting healthy eating. Dell also has four children of her own. The Alliance for a Healthier Generation, a national nonprofit organization founded by the American Heart Association and William J. Clinton Foundation, was created in May of 2005 with the goal of reducing the nationwide prevalence of childhood obesity by 2015. The Alliance has been a grantee of the Michael & Susan Dell Foundation since 2007. The foundation funds two district wide implementations of the Alliance's Healthy Schools Program with goals to establish healthier school environments for students, teachers and staff.